In this tutorial, you will learn how to enhance the attribute table widget you built in the Create a widget tutorial by adding some configuration logic to it. You'll allow the operation view author to choose the fields of a data source, then use a table to show the chosen attribute information for each feature from the data source. The same concepts in this tutorial can be applied to configure map tool and feature action extensions. Note: If you didn't complete the Create a widget tutorial, you can download the source code from here to continue this tutorial. Before you begin, you must set up a development environment for Windows Operations Dashboard and prepare it to run in developer mode. A PNG (or JPG) image file for the widget's thumbnail. tableConfig.html–The user interface (UI) of the widget's configuration that will load into the Data tab of the Settings dialog when configuring the widget within an operation view. It shows a list of checkboxes for each field of the data source to be chosen by an operation view author. tableWidgetConfigTemplate.html–A template or an HTML fragment that will be incorporated into the tableConfig.html file. This template has a Dojo CheckedMultiSelect form that will be manifested as checkboxes for the alpha-numeric fields of the selected data source. 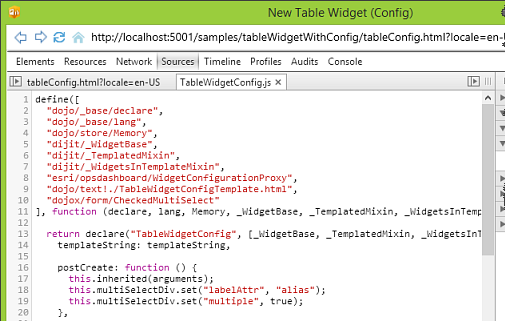 The business logic of the template is implemented in the tableWidgetConfig.js file. Note: You can assign different names to the above files. Open the tableConfig.html file and add the following code to set up the basic structure of an HTML5 file. Between the <body> tags, create a div element and add a "data-dojo-type" attribute with the value "extension/ TableWidgetConfig". This attribute will be used to instantiate an "extension/TableWidgetConfig" object that has the logic of the table configuration dijit you are going to implement. Open the TableWidgetConfigTemplate.html file and add the following HTML fragment to define the UI of the table configuration dijit. In the CheckedMultiSelect <div> element, set "multiSelectDiv" as the value for the data-dojo-attach-point property. This "multiSelectDiv" pointer will be used by the TabletWidgetConfig class to communicate with the configuration UI. In addition, define the onSelectionChanged event handler when the selection on the form changes (i.e. when a field checkbox is checked or unchecked). Open the tableConfig.html file again. Before the closing <body> tag, add the following <script> block with the dojoConfig object to define the module (i.e. the table configuration dijit) that will load. Set the "async" and "parseOnLoad" properties to true. To learn more about dojoConfig, read the Dojo Toolkit documentation. Note: Within the "paths" object, the URI of the extension folder is referenced as "extension". This is used to construct the relative path to the widget configuration dijit (i.e. "extension/TableWidgetConfig") in the dojo-data-type attribute of a <div> element in this file. Open the tableWidgetConfig.js file and add the following define function to define the table configuration dijit. In this function, load the dependent modules and pass in a callback function with the modules as parameters. Declare a class named "TableWidgetConfig". The second parameter is an array of super classes that are inherited by the TableWidgetConfig class. The third parameter is an object that will contain the methods to be called throughout the lifecycle of the class. Inside the TableWidgetConfig class, load the TableWidgetConfigTemplate.html file into the templateString as an inline string. Add a postCreate function. Through the "multiSelectDiv" pointer set the "multiple" property of the CheckedMultiSelect form to true so that they will render as checkboxes. Then, set the labels of the checkboxes to be displayed by the alias of the fields. After creating the postCreate function, add a dataSourceSelectionChanged callback. It will be called when the table widget is initialized and when the operation view author selects a different data source. The callback for this event accounts for two parameters: dataSource and dataSourceConfig. The dataSource parameter represents the data source chosen by the operation view author. The dataSourceConfig parameter is an object that stores the fields chosen by the author. If you implement additional properties in your extension, you can also include them in this object. When the author saves the view, the properties of the dataSourceConfig object will save with the operation view. As a result, when the operation view is opened again, these properties will feed back into the dataSourceConfig object. In the dataSourceSelectionChanged callback, reference the dataSourceConfig using this.dataSourceConfig, and get the data source's alpha-numeric fields. Then create a memory store object with the fields. Finally, in the dataSourceSelectionChanged callback, add the logic to retrieve the previously selected fields from the dataSourceConfig.selectedFieldsNames property, and use them to check the field boxes. This part of the logic was needed when the operation view was previously configured and some fields were chosen from the table configuration UI. After creating the dataSourceSelectionChanged callback, implement an onSelectionChanged callback. This callback will be called when a checkbox is checked or unchecked. In this callback, the selected fields will be retrieved through the "value" variable. The alias of these fields will then be saved into the selectedFieldsNames property of this.dataSourceConfig. At the end of the callback, add the logic to check if there is at least one selected field. If there is, enable the OK button by sending a true flag to the readyToPersistConfig method (readyToPersistConfig is a method inherited from the WidgetConfigurationProxy's base class). Now, the names of the fields chosen by the operation view author through the table widget's Settings dialog will be extracted from the dataSourceConfig object. These fields will then be queried by the chosen data source and the results will be rendered in the attribute table. Update the styles for the configuration UI. Your extension is now ready for testing in Operations Dashboard. 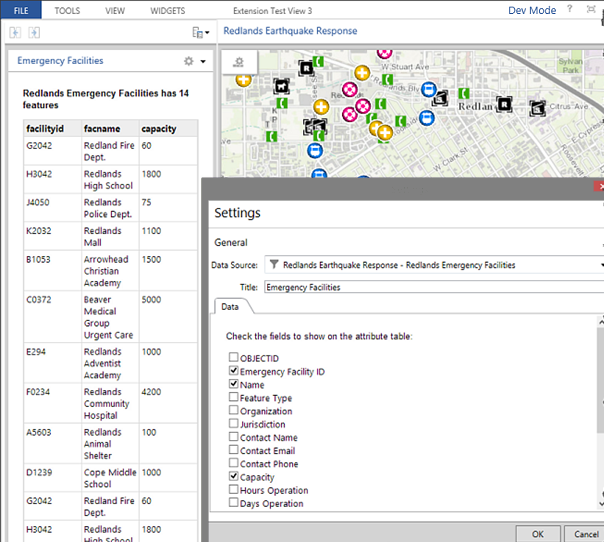 Start Operations Dashboard in developer mode, and sign in to your ArcGIS organization as a publisher or an administrator. Create a single-display operation view and select a map. If you create a multi-display operation view, you can only open it in the Windows app, and you won't be able to debug your extension in the web browser. Note: To learn more about creating an operation view, see Create an operation view in the PDF of the operation view help. Click on the Add Widget, the table widget should be listed under the Custom category. Tip: When an extension is loaded in the developer mode, it will have a red bounding box to help you distinguish it from extensions in production. 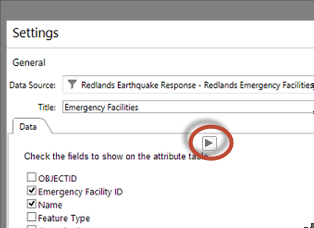 Double click the table widget to confirm the selection and open its Settings dialog. The UI under the Data tab originates from the tableConfig.html file. You should see the checkboxes created for the alpha-numeric fields of the currently chosen data source. Click the Debug button at the top of the configuration UI under the Data tab to launch the Operations Dashboard extension debugger. Tip: You can also click the Dev Mode text at the upper right corner of the app, then click Open Debug Tool to launch the debugger. Once the debugger is launched, you can start inspecting the UI elements on the tableConfig.html file, or set break points and step through the business logic in tableWidgetConfig.js, and more. The URL to the HTML page shown on the debugger starts from localhost:<port number> because the extension is running from a local server. Tip: If you make a change to the HTML or JS file during debugging, you can click the Refresh button at the top left corner of the debugger to get the update. However, if you make any changes to the manifest, you will need to save the operation view, then close and reopen it. Click OK to create the widget. If you want to debug your extension using the web browser, follow the steps below. Click Dev Mode in the upper right corner and choose Open in Browser. The operation view will open in your default browser. Use the built-in debugging tool of your browser to debug your map tool. Note: Since you are hosting your extension in the local server, you need to keep the Windows app and the local server running.